Planetarium Presentations occur rain or shine, starting at 7:30 PM. There will be safe observing of the Sun beginning approximately two hours before sunset through the 4” Lunt Hydrogen Alpha telescope. After dusk using both the 10” D & G Refractor and the 24” Optical Guidance Systems Reflector telescopes, observe the wonders of the May night sky. Some objects observed may include views of Jupiter and its moons, Mars and the craters of the Moon. Many deep sky objects may also be observed such as the Ring Nebula and other nebulae, clusters and double stars. Presentations about current events in astronomy and the Mingo Creek Park night sky will take place in the Richard Y. Haddad Planetarium at various times throughout the night. 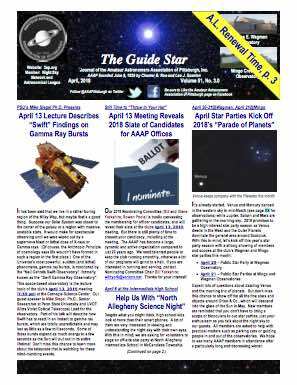 AAAP Vice-President Kathy DeSantis will be making a special presentation during the May Star Parties. Visit our website to get more information at www.3ap.org. Respectfully submitted, Kathy DeSantis based nearly all on the Press Release of Becky Nichols, Mingo Observatory Director.